Burnham Thorpe01485 532610work VillageAround ½ mile inland from Burnham Market, the village of Burnham Thorpe is the birthplace of Horatio Nelson. His father, Edmund Nelson, moved to Burnham Thorpe in 1755, after his marriage. Horatio, the 6th of their 11 children was born on 29th September 1758 at the Parsonage. He also lived here with his wife between 1786 and 1793 while waiting to be assigned a ship. Sadly the original building was demolished, but the property that replaced it has a plaque on the garden wall, which is visible from the road. Lord Nelson’s father was Rector, of All Saints Church. When the church was restored in 1890, the Admiralty donated wood from the HMS Victory to the church, from which the lectern, altar and rood screen were made. A bust of Nelson and the tombs of his parents are in the chancel. Flags flown by HMS Indomitable at the Battle of Jutland, and by HMS Nelson, are in the nave. 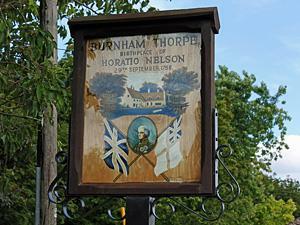 Around ½ mile inland from Burnham Market, the village of Burnham Thorpe is the birthplace of Horatio Nelson. His father, Edmund Nelson, moved to Burnham Thorpe in 1755, after his marriage. Horatio, the 6th of their 11 children was born on 29th September 1758 at the Parsonage. He also lived here with his wife between 1786 and 1793 while waiting to be assigned a ship. Sadly the original building was demolished, but the property that replaced it has a plaque on the garden wall, which is visible from the road. The village's main public house was built in 1637 and was known as The Plough until 1798 when it was renamed The Lord Nelson in honour of the victory at the Battle of the Nile. The pub has no bar, and real ales are served from a tap room. The look of the pub in Nelson’s time has been preserved, with wooden settles (including one on which the Admiral sat), stone floors, and plenty of Nelson memorabilia on the walls.